I think that since every generation has males affected only, the trait must be Y-linked. Also, since every generation expresses the trait, I think it should be dominant. 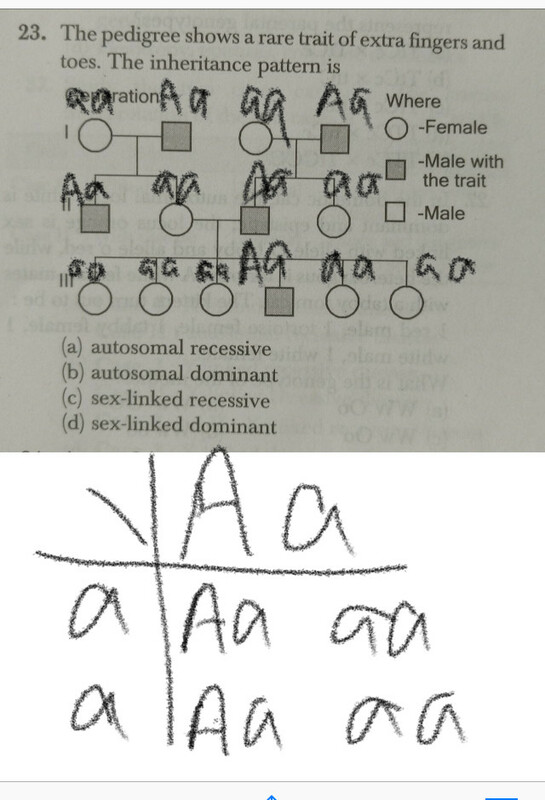 However, the answer key says that the answer is autosomal dominant. Could someone please clarify this and give a tip on how to recognise the difference? You're right that this could just as well be Y-linked dominant (althought that is pretty rare due to the small size of the chromosome). The only reason pointing more towards autosomal dominant is the mention of "extra fingers and toes". Most cases of polydactyly are inherited in an autosomal dominant way. Does seem like an unfair question, though, since (at least in theory) there's more than one possible answer. This clearly shows that the disease is autosomal dominant. But there is one problem. The pedigree in the question satisfies all 3 points except the last one. If there are 6 offsprings, at least 2 of them should be affected (if not 3), but there is only one, and that too a male. Since only the male is affected in all generations, you’re right in thinking it’s Y linked. In my opinion, it can be Y linked dominant, since that’s very rare. And your question specifies that the trait is rare. It could DEFINITELY be autosomal dominant, had there been more affected offsprings in the third generation. Not the answer you're looking for? Browse other questions tagged genetics pedigree or ask your own question.